In case you don't live in Southern California, you might not know that we are currently in the middle of the heaviest rainstorm that we've had in years. It has rained for five days straight and is still going strong! I love rain because it means snow in the mountains. But while I'm not snowboarding in Mammoth, I love to be at home, drinking hot chocolate while the rain is flooding the streets. 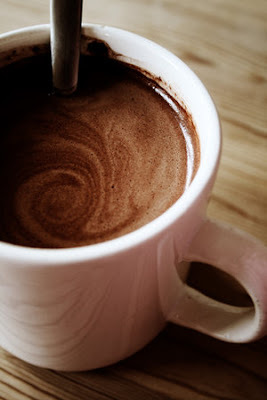 In honor of this wonderful rain, I'd like to highlight hot chocolate. I've been a hot chocolate fan my whole life. There was even a time that I used to drink a mug of hot chocolate every night before bed (before I watched calories). I still treat myself to a zebra hot chocolate from Starbucks once a month. 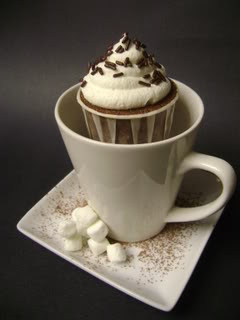 I Heart Cuppycakes has a recipe for a Hot Chocolate Cupcakes: a chocolate-chili cupcake with marshmallow whipped cream frosting, topped with chocolate sprinkles. This makes me want to stay home from work, get warm with my Snuggie, and eat a hot chocolate cupcake (while drinking hot chocolate, of course). I love getting warm with my snuggie too and drinking hot chocolate! Coincidentally, I drank two hot chocolates on Friday. They were both so good and perfect for a very rainy day.